Can’t decide whether to wear your riding boots over or under your jeans? Not sure if you prefer the windswept feeling of an open-face helmet or the protection of a full-face number? Confused about whether or not you really want to take the missus for a burn? Then you are going to love the new Indian Springfield Motorcycle. Indian didn’t really need to find a gap in its range for the new Springfield because this bike has multiple personalities and can be changed to suit whatever mood you’re in when you head off for a ride. 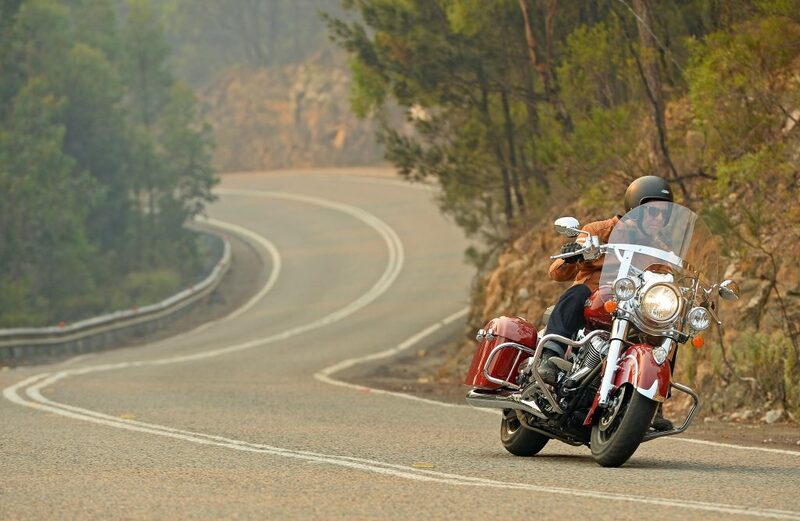 But what exactly is it – a bagger, a tourer or a cruiser? Well, it is a little bit of everything rolled into one big highway rollin’ good ol’ boys package. The large screen up front provides a touring persona, but can be quickly and easily removed to turn the Springfield into a bagger. The hard cases, previously only available on the full-fared Chieftain and Roadmaster, can also be removed with ease to convert the Springfield into a cruiser, while taking off the pillion seat makes it a bobber. And thanks to a smart move by designers to incorporate the required mounting points, the topbox from the Indian Roadmaster can also be installed, pushing the Springfield into the touring realm, albeit the shallow end of the long-haul wading pool – it still lacks full fairing. However you want to classify it, the Springfield is another addition to the growing Indian range that draws heavily on the company’s heritage. 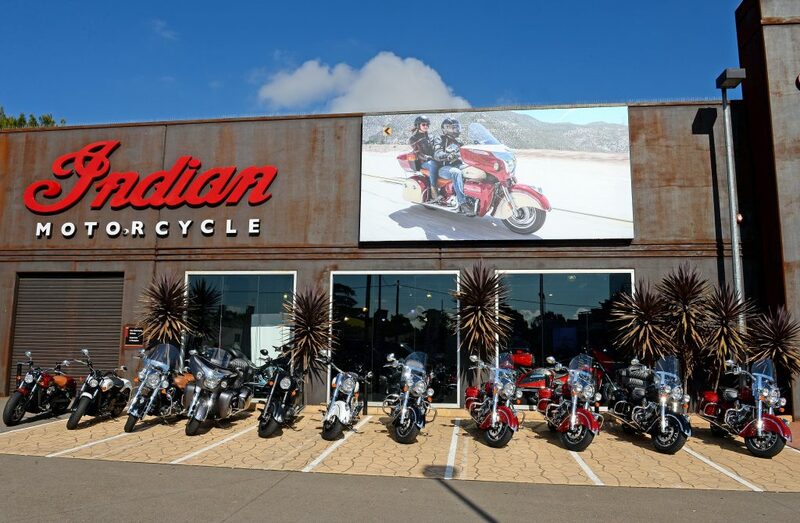 Standing in the Indian Motorcycle showroom in the Sydney suburb of Ashfield, the departure point for the Australian launch of the Springfield, I had to remind myself that the current incarnation of Indian took its first breath just three years ago. Prior to the unveiling of the Springfield, the Indian range already consisted of the Roadmaster, Chieftain, Chief, Dark Horse and Vintage, with a few variations of most models also available – and that’s just the air-cooled V-twin range. There’s also the water-cooled V-twin Scout and Scout Sixty models. 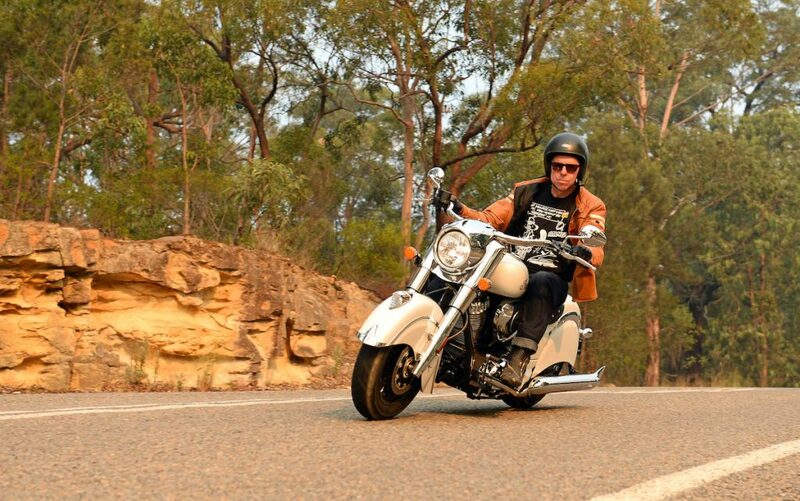 While this launch was for the new Springfield, Indian also laid on its entire range throughout a two-day ride to the Hunter Valley via the famous Putty Road. It was a great refresher course in the famous American marque and a chance to see how much effort Polaris had put into reviving the name. Like the entire Indian range, except for the Scout, the Springfield has at its heart the Polaris designed and built Thunderstroke 111 engine. As well as being an awesome 1811cc air-cooled V-twin powerplant choc full of low-rev torque (139Nm at 3000rpm), it’s also a gorgeous looking motor covered with lashings of chrome and stylish touches. These include fake air-fin covers over the exhaust outlets to make it look like the pipes are exiting from the side of the cylinder in the same fashion as on the side-valve motors of old. It is this sort of attention to detail which is helping Indian to make big inroads into the cruiser markets around the globe. Cosmetically the Springfield is easy to differentiate from its siblings. It has a fork-mounted Perspex screen and standard fitment riding lights like the Vintage, plus the same hard bags as the Chieftain. The new contoured seat is unique to the Springfield model. There’s also a host of changes under the skin that set the Springfield apart from its Chieftain and Vintage siblings. I have previously applauded the Chief Vintage – along with the Classic and Dark Horse variants – for its sweet handling chassis. While the Springfield designers must have been tempted to simply use this as a base, a few geometry tweaks have given the new bike its own unique set of handling characteristics. The cast aluminium chassis from the Vintage has been fitted with the steering head from the Chieftain, giving it the same 25º rake angle as the latter model – four degrees less than the Vintage (29º). The trail is the shortest of the three at 132mm (150mm Chieftain/155mm Vintage) while the wheelbase of 1702mm makes it piggy in the middle (Chieftain 1669mm/Vintage 1729mm). These geometry changes described above have been made to give the Springfield a balance that suits its multiple personalities, with a slant towards touring with the extra weight of a pillion and stocked panniers. Comparing the Springfield to the Classic during the two-day ride I felt the steering of the Springfield was lighter without losing the connected feeling I enjoy in the Classic. The rear subframe has been designed to handle extra weight, and the dual exhaust pipes have weight-bearing pads to assist with supporting the hard saddlebags. There’s also wiring in place for the remote locking panniers, which means nothing else needs to be installed for the electric locking and lights on the topbox – just plug it in. 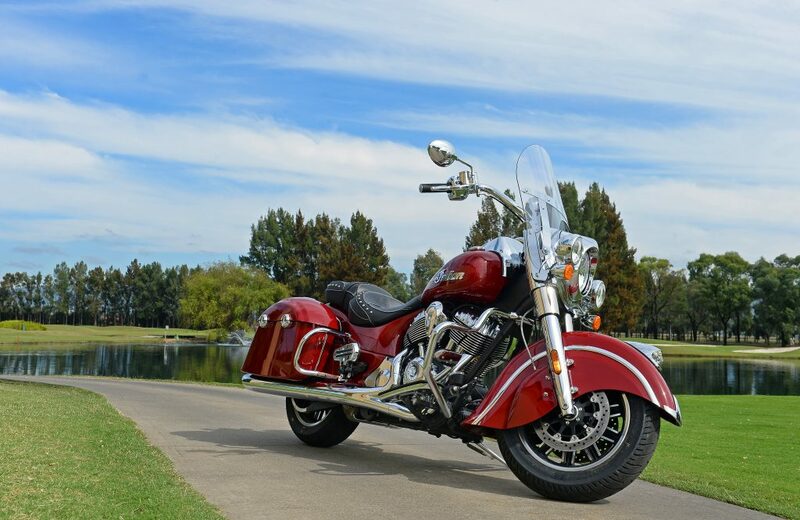 Wheels are the standard Indian issue 16 x 3.5 front and 16 x 5 rear, in cast aluminium to allow for the fitment of tyre pressure sensors, an important addition to the electronics package of any big heavy tourer/cruiser. From the rider’s seat the sweptback handlebar at first appears a little narrow, however, after riding for a short time the positioning starts to make sense and feel comfortable. The narrowness also keeps your hands and shoulders more behind the screen and protects you from buffeting. The screen is a traditional large Perspex design that works well with the heritage styling of the Springfield. Three screen sizes are available and being on the taller side my line of vision was over the top of the standard issue screen; yet I was still out of the wind blast. It may look like a simple flat Perspex screen but the shape and angle eliminates the annoying low pressure area around the rider which creates buffeting. Shorter riders have reported difficulty seeing through the tall screen due to vibrations and sun reflection, so keep this in mind when taking one for a test ride and try all the screen sizes if available. Just below the screen a large a heritage style headlight with chrome surrounds is complemented by driving lights, which are standard fitment. The beefy 46mm front fork with 119mm of travel and air-adjustable rear monoshock with 114mm of travel provide a smooth and comfortable ride on A-grade roads, though things did get a little bouncy when the pace picked up on the back roads north of Sydney. Still, it was nowhere near as bad as the pounding my back has received on similar-sized tourers and cruisers along the same road. After two full days in the saddle I had scribbled in my notes that the ride was ‘plush’, however, a lingering sore shoulder indicated a slight adjustment of the handlebar would be required if I owned one. While the Springfield had no trouble piling on the speed, it twice suffered from a little head shake when pushed out of its comfort zone through the twists of the Old North Road. This could be attributed to a number of things and a quick chat with fellow journalists uncovered just one other report of a similar occurrence. 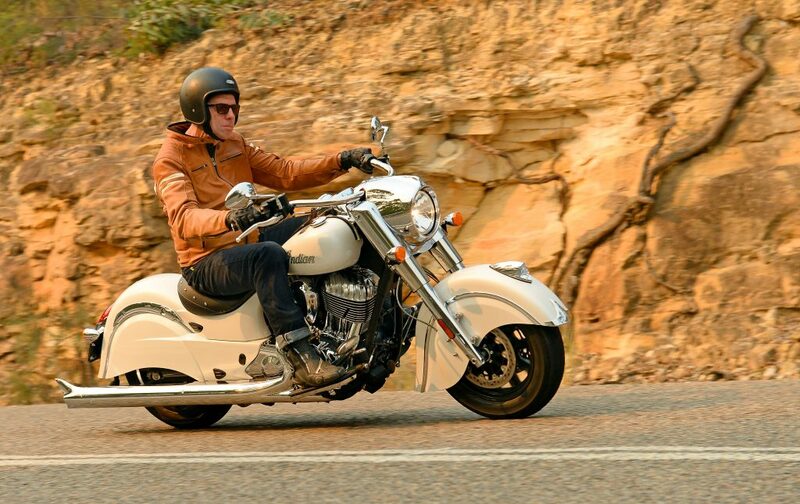 The sweet handling of Indian’s lovely cast aluminium chassis remains, combined with the longer wheelbase and shorter trail, has put a little sharpness into the Springfield’s responsiveness compared to the Vintage. Not a bad thing as it fits in with the style of the new bike and when riding two-up would probably make for an easier steering machine – and that is the Springfield’s design brief. The footboards are set high enough to provide just over 30º of lean and and only scrape when you are really hooking into a corner. Having a low 660mm seat height is great for the vertically challenged. The trade-off for taller riders like me is that your knees sit higher than the trademark teardrop-shaped tank. That tank, like everything else on the Springfield, screams Indian. It has a centrally mounted heritage-style analogue speedo incorporating a digital display insert which provides you with a large selection of scroll-through information including tyre pressure monitor, cruise control indicator, tachometer, electronic speedometer, odometer, fuel remaining, dual trip meters and clock. Also set into the chrome tank-mounted binnacle is an analog fuel gauge and the bike’s on-off button for the keyless start. The button is one of a number of modern touches on the bike along with the tyre pressure monitoring system and cruise control, all of which are standard. Another standard feature which is useful for riding single or two-up is the front and rear highway bars. As well as being a great place to mount accessories such as additional riding lights and highway pegs, they may save your bacon if the Springfield suddenly tips too far to one side. As long as you have hold of the bike you can use the highway bars to take its weight while you regain your footing and pull it back upright (or get a friend to help you). Embarrassingly, I was able to test this first hand when I allowed the front tyre to wash out on a gravel road at walking pace. Pillions are looked after with adjustable footboards. This may not seem like a big deal at first, but when you consider the difference in seating potion between a pillion with and without a backrest or topbox, the adjustability could mean the difference between arriving at your destination ready to kick on or ready for a chiropractor. Twin 300mm floating disc brakes and four-piston calipers with braided brake lines look after stopping duties up front, and there’s a 300mm single disk and two-piston caliper at the rear. The ABS equipped anchors do an exceptional job of pulling up the 388kg wet weight of the Springfield without much complaining and there is plenty of feel back through the lever. When tested at high speed they proved to be well on the game, but there were a couple of times in traffic when the lack of strong initial bite caught my attention. The Springfield slots into the Indian range between the Chief Vintage and the Chieftain. While it can be viewed as three bikes in one, it’s main strength is in short- to medium-range touring thanks to its fork-mounted screen and hard case cargo space that can easily be expanded by fitting of a topbox (which doubles as a pillion back rest). A sissy bar is also on the options list. The Springfield is already available in Australian showrooms in a choice of Thunder Black and Indian Red, with a price tag of $33,995 ride away. 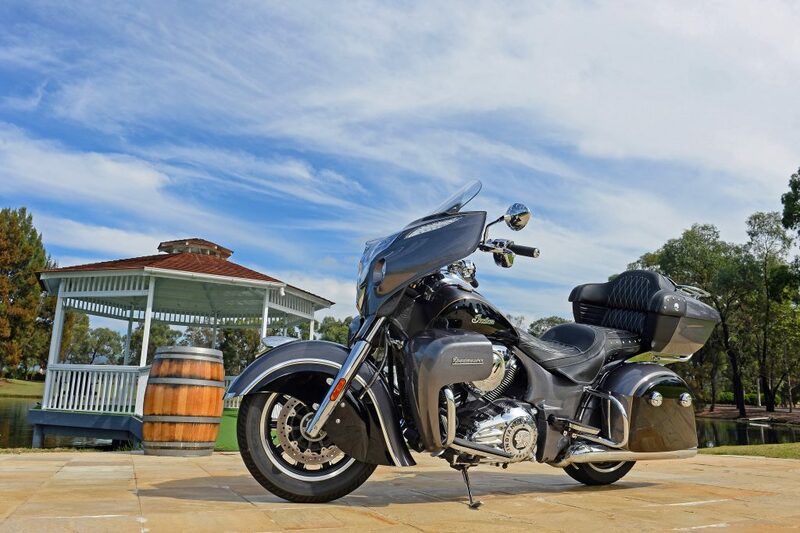 It’s up against Harley-Davidson’s Road King ($32,495 ride away) but working in the Springfield’s favour is its shiny newness and the premium Indian name, while the Road King has gone a couple of years without a major upgrade. Would I have one in my garage for that price? When you consider its multiple personalities you are getting a lot of bike(s) for your buck. It’s $3000 less than the Chieftain and only $1000 more than the Vintage so from that angle it is good buying. As we know, choosing your next motorcycle also involves a lot of emotion and on that score it would be a tough choice between the Vintage and the Springfield. I’m glad I don’t need to decide.